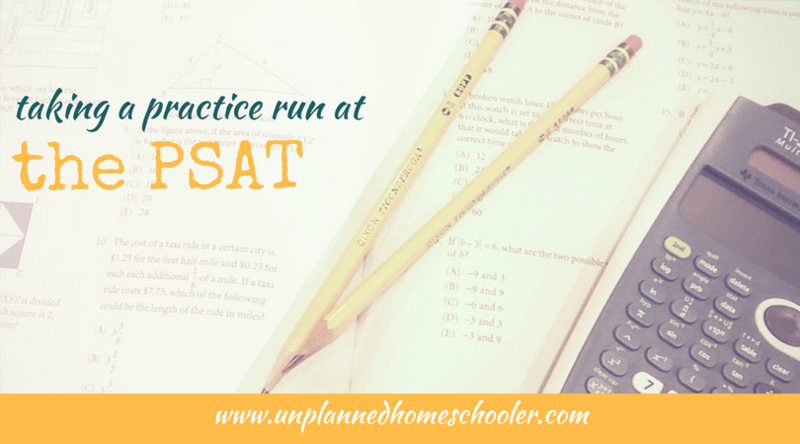 Did you know students can take the PSAT for practice, without it counting against them, as long as they take it before their junior year? That's what my twins are doing, and frankly, I'm a little jealous. 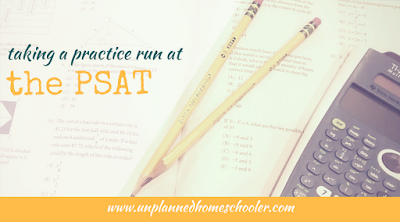 Knowing that students often raise their scores on the SAT and the ACT when they take it more than once, I can't believe more of them don't take advantage of the opportunity to take a practice run at the PSAT in their sophomore or even freshman years of high school. But they probably don't know that they can, or they think that it will count against them. Are you raising a child who tends to personify everything? I was one of those kids. I remember with almost embarrassing clarity one boring afternoon in my preteen years when I determined the gender of the numbers 0 - 9. For whatever reason, 2, 3, 5, 7, 8 and 0 were boys, and 1, 4, 6, and 9 were girls. I'd like to say with authority that there is strong scientific evidence that associates this sort of behavior with creative genius, but that would require scouring psychological journals. Speaking simply from experience though, I can say that my own tendency to personify things helped me to learn, especially when it came to science. I assigned personalities to everything from different species of animals to various types of bacteria and even the elements of the periodic table in my mind. I think that's why I was so excited to find a complete set of the Basher Science books at a secondhand store a few years ago. One of the Basher books is called The Periodic Table: Elements with Style, and it allows readers to meet and get to know the personified elements, complete with characteristics you would expect based on how they appear and react in nature. Sodium, for instance, gets along with everyone but is really high strung, sulfur is a prankster dressed sweetly in yellow, and iron is "at the center of everything." Imagine my excitement when I realized, after recommending the book to our local co-op class, that there is a newer version, with more elements, each with its own descriptive page! It's titled, The Complete Periodic Table: More Elements with Style. If you have a child who is interested in learning more about chemistry, you need to check out this book, currently on sale for 45 percent off the list price, but I don't know how long that will last. Associating human characteristics with inanimate objects really has been a good way for me to learn and retain information over time. 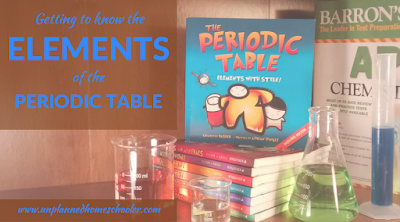 I believe the Basher Science books about the periodic table can help cement this information in your child's long term memory, too! For all the negative imagery we see on the news and in social media, I really don't believe the world is falling apart. I don't believe we're on the brink of a race war, or that most men are out to victimize women, or much of anything the media might have us believe about our fellow human beings for the sake of ratings. I believe that at the heart of it, there is more that unites people than divides them, and if we could all just try to treat each other the way we'd want our kids, or our grandmothers to be treated, the world would be a much better place. But it's hard to get away from those constant messages of division and hate. Homeschoolers can live somewhat sheltered lives, it's true. Their circle of interaction is typically smaller than the hundreds of peers other kids pass in the halls of a public school And in many families, their exposure to social media is more closely monitored. 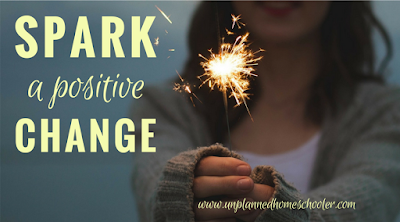 We can choose to minimize their exposure to the constant stream of negativity, and instead emphasize the good in the world. That's why I think homeschoolers, in particular, have a tremendous opportunity to change the world. All it takes is a little spark. One of the lessons I am working hard to teach my kids is kindness. I've noticed that they go out of their way to hold doors for others. They offer to carry things for people, or pick up dropped objects. These little things may seem ordinary, and used to be thought of as just good manners, but consideration for others is a learned behavior. I've been working to teach my kids, both through discussion and example, what a difference a kind word can make. Yesterday, while my mom and I were sitting in a waiting room at the cancer treatment center, I noticed the elderly black man with the furrowed brow sitting across from me. He had taken three or four deep breaths in a row, letting each one out in a slow sigh. I didn't know if he was worried or just uncomfortable. Then I noticed his shoes. Hey, friends! 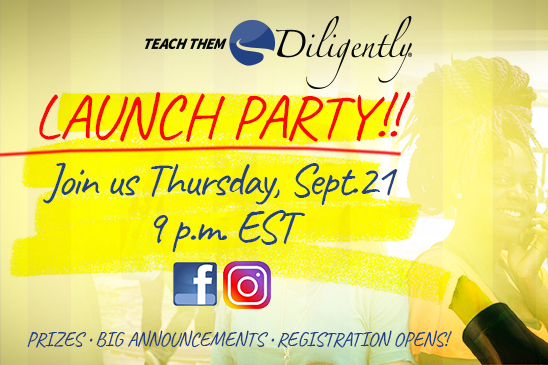 Don't miss the 2018 Launch Party for the Teach Them Diligently homeschool conventions. Your friendly neighborhood Unplanned Homeschooler is an affiliate this year, and maybe more. Can't say yet. I don't even have the scoop for sure, but I am really excited! And wow, there will be more than $3500 in prizes, including a couple from me and lots more from other fabulous folks who you might know even better! 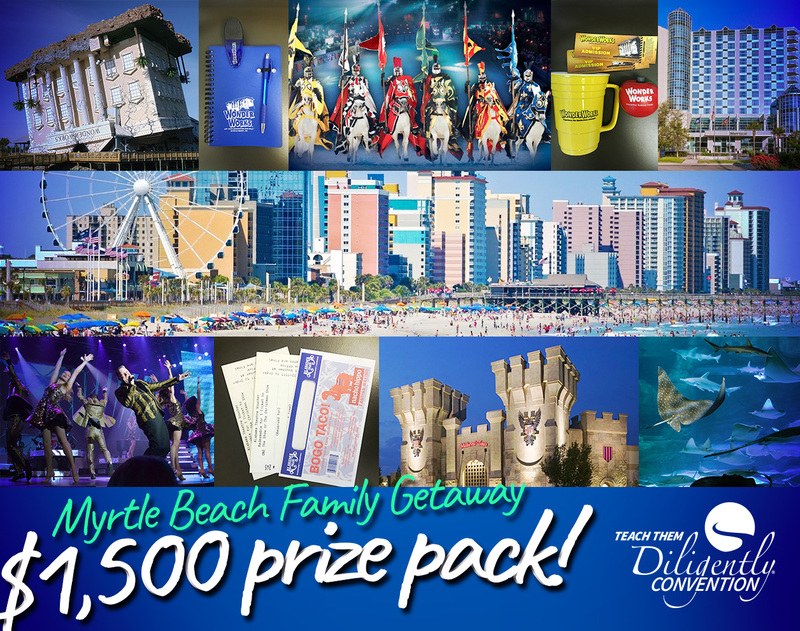 One lucky winner is even going to win a $1500 family getaway! It could be YOU. But not if you don't come to the party. So click one of the images or this link here and come on! 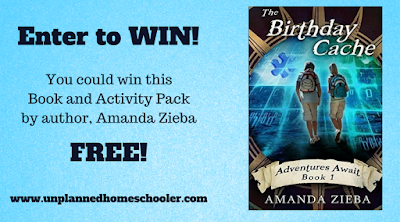 Thanks to the generosity of my friend, author, Amanda Zieba, you can win an amazing prize package including a copy of The Birthday Cache, a book about roadschooled twins, Mason and Molly Miles, and their journey to adventure. Also included is The Birthday Cache unit study and The Birthday Cache journal writes. This amazing package is perfect for homeschooling families who love adventure, or who are interested in roadschooling or geocaching. The Birthday Cache is available on Amazon, and the unit study and journal writes are featured in Zieba's Teachers Pay Teachers store. One lucky winner will receive all three, absolutely free! While twelve year old Mason Miles and his parents love their nomadic lifestyle living and working across the nation in their RV, his twin sister Molly is craving a normal life and scheming to put an stop to their endless road trip. For their twelfth birthday the twins open a GPS receiver and fall in love with the sport of geocaching. When they stumble upon a mysterious puzzle cache will their travels become interesting enough to change Molly's mind? This giveaway begins September 20, 2017 and runs until midnight, September 30, 2017. One winner will be chosen at random from all eligible entrants. Please complete all steps for additional chances to win. The book and activities will be delivered in a digital download format. Winner will be notified by October 2, and must supply a valid e-mail address upon selection for delivery. Take a five pound bag of sugar and dump out about 1/4 of it. That's how much my youngest baby weighed when she was born. She was so tiny and more than a month early. I knew she was coming the day before. 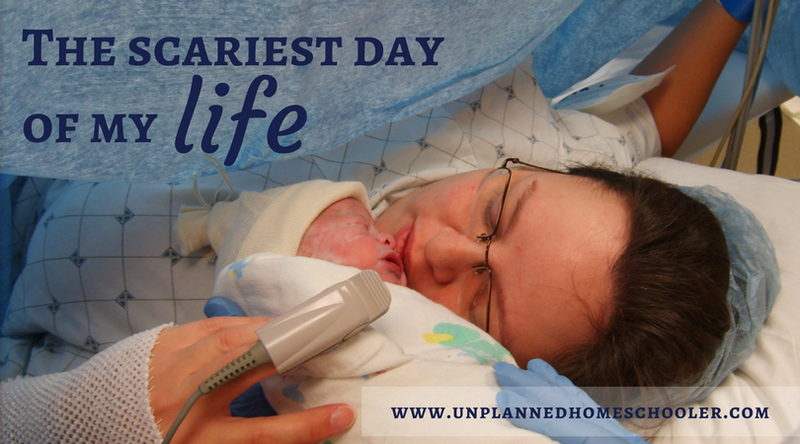 My doctor told me they had to take her by C-section the next morning, or risk her dying in the womb. I had less than 24 hours to process the fact that my baby was in imminent danger, and the only way to save her was a serious risk in itself. That was ten years ago today. It's almost impossible to believe that my little preemie has grown into such a rambunctious, sassy, preteen girl. Ten years ago, as I lay in the hospital waiting to be taken back to surgery, I could not stop the tears. The previous afternoon, the doctors had done the most advanced ultrasound workup they could do. They had estimated her weight at around three pounds, but said that her best, and likely her only chance to survive was if they could get her out of my womb quickly. My placenta was breaking down and leaving her there was sentencing her to starvation. My youngest was supposed to be my easy baby. My healthy singleton. I'd already been through a high risk pregnancy, premature birth and NICU stay with my twins. But things don't always go according to plan. My twins were both born bigger than her and a week further along, and their first few months had been arduous. I was so scared. Would she survive the birth? If so, would she make it through the challenges that surely awaited? There were no guarantees. Where is this road taking me? After one of the hardest years of my life, I thought the road was finally straightening out, but just like that it took another twist. Where are we headed now? I don't know of anything that makes you feel more like a powerless backseat passenger of life's journey than dealing with the prolonged illness of a loved one. That's exactly the road I've been traveling with my mom for the past year. You might say she's had one the worst years of her life, or the best, depending on how you choose to look at things. It's been a solid string of events that, one after another, it was a miracle she even survived. For that, we are immensely grateful. This time last fall, my mom started to feel bad, and it kept getting worse. Her blood pressure kept climbing, no matter what her doctors did to adjust her medication. Finally, after changing her cardiologist, a blockage was discovered in a renal artery, but not before her blood pressure had reached such high and sustained levels that she had multiple small strokes and ended up hospitalized right before Christmas. Surgery was scheduled for her kidney, and one problem was fixed. But open heart surgery was on the horizon. Less than two months down the road, she was under the knife again. Within just a couple of weeks after the bypass, it was clear she was not out of the woods. Another surgery to correct more arterial blockages followed, after weeks of excruciating pain. Apparently when you unkink a hose up the line, any blockages downstream scream out in agony from the new pressure. The third round of vascular surgery stopped the pain, and soon my mom appeared to be truly on the road to recovery. We said so many prayers of thanksgiving, knowing beyond a doubt that she had narrowly escaped death on multiple occasions this year. It looked like clear road ahead. We started our new school year and got a few chapters into Algebra 2 and Geometry, signed my youngest up for co-op and started preparing for driver's ed with the twins. Things were going smoothly enough we even scheduled my older daughter's tonsillectomy, for just about the time the water park closed for the summer. I even started to revive my blog. My mom, at age 70, was getting better, albeit slowly, and we all started to feel like we could take a deep breath and put this difficult season behind us. But the late summer cold she caught kept holding on, with a cough that refused to go away and shortness of breath that seemed to be a harbinger of trouble to come. 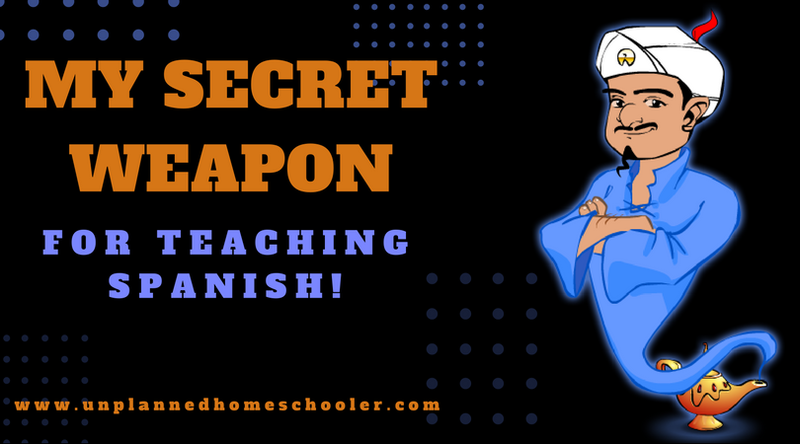 I have a new secret weapon for teaching Spanish, and it is muy efectivo! Your kids may already be familiar with this powerful tool, and think that it is just a fun game they stumbled upon online. But they do not know the whole truth. Akinator, the Web Genie, is a popular game, wherein the user chooses a character and the Akinator attempts to guess the character's identity using yes/no questions. My kids introduced me to the game last year, and we have been playing ever since, trying to stump the Akinator with characters we hope he will not be able to guess. The character you choose can be a real person, like a celebrity or historical figure, or you can choose fictitious characters from books, television, movies, or video games. The Akinator has successfully guessed all sorts of characters, from Thomas the Tank Engine to George Washington, and just about everyone in between. In fact, one of the only characters I have been able to stump him with was Phronsie from the classic book, The Five Little Peppers. The Akinator seems to know just about everyone in this universe and beyond. There is no better tool for helping a student learn than one they love to use. When my kids started taking Spanish this fall, I found a few resources I thought they might like. I even ordered a subsciption to People en Español. But when I remembered that the Akinator game was available in several different languages, including Spanish, I knew I was on to something awesome. Si! Si! And now, thanks to Google Translate, we know that una araña radioactiva means a radioactive spider. We have new words! We decided to try another character, this time a real person chosen by 9-year-old daughter. Within just a few questions, the Akinator was on the right track. ¿Su personaje está relacionado con el mundo de la música? ¿Su personaje es un cantante? ¿Su personaje tiene pelo rubio? ¿Su personaje suelen llevar los labios rojos? Is my character related the world of music? Is she a singer? Does she have blonde hair? Red lips? Oh my gosh! Yep, the Akinator got me. My character was Taylor Swift. I'm going to have to think a lot harder if I want to stump him next time, but look at all the new vocabulary words we've picked up just playing a couple of times. Check it out. It's free to play, and a whole lot of fun! I am always on the lookout for a great deal. Cheap curriculum is good, free is even better, but only if the resources are high quality and serve my purpose. I don't have time to waste on lousy resources, even if they don't cost me a dime. That's why I decided to do a test run when I learned that Universal Class offered free classes through my local public library. I've been burned by free classes and extraordinarily cheap offerings on sites like Groupon before. Never again. This time, before adding anything to our fall semester, I spent a few weeks trying out one of the free classes as an enrolled student, just to see how effective the course would be. Choosing a course wasn't easy. Universal Class has more than 500 classes in their course catalog, on everything from aromatherapy to precalculus. And although individual courses can cost more than $100 if you pay for them yourself, I had access to the whole smorgasbord for free if I logged in through my library portal. Which one would I choose? She's sitting on her bed, a tear rolling down her cheek, feeling completely and utterly alone. She's embarrassed, and ashamed, and she doesn't know what to do. No part of her can believe that you will understand this thing she did. Or forgive her for it. She's never done anything like it before. She doesn't even understand why she did it, or why she was tempted to do it again. Maybe God can't even forgive her. She tries to pray, but feels so ashamed and unworthy. If only you knew this secret she carried, you could take her in your arms and promise her it would be okay. You could reassure her that you love her, no matter what, and that God loves her even more. His capacity for forgiveness is immeasurable, and because it is a gift that He gives freely, there is no question of being undeserving. Nothing we ever do could make us "deserving" of God's love... He just loves us because He does, even when we screw up monumentally. If she would just come to you, you could share with her your own frailty, and your own confidence that you have been forgiven, maybe for things even worse than this horrible secret that is eating away at her. You could help her see that there are ways to make things right, and even if something can't be undone, there are ways to start over on a good path, to rebuild trust, to feel better. What can you do when you don't even know she's hurting? If you live near a Sonic Drive-In, you probably already know that they are famous for their amazing array of drink combinations. In fact, according to a 2016 press release, Sonic's menu had reached an astonishing 1.3 million different drink combinations, up from the "more than 168,000" it had boasted in 2007. Now, that would be one heck of a menu if all the possible combinations were listed, but thankfully, they are not. Instead, there is a menu of possible choices, from which thirsty diners can pick and choose and customize the perfect drink for each member of the family. If you think Sonic has a lot of choices on their drink menu, you should take a look around at all the different curriculum options available today. There are so many different choices, way more than there were a decade ago. Some folks still like to go with a boxed curriculum where the whole package is set up for them, much like the customers who order a plain Coke. That's okay if it works well for them, especially if they are new and might find the abundance of choices a bit overwhelming the first year. But most of the experienced homeschoolers I know like to choose from all that's available: one option for math, another for language arts, something else for science and history. Mixing and matching they come up with a unique combination all their own. Instead of that basic Coke, maybe they have a cherry,vanilla, Dr. Pepper, or a grape, raspberry, frozen lemonade with sour candies mixed in. The variety is virtually endless. And just like choosing your drinks at Sonic, you can choose something different for every member of your family, trying out different options until you find favorites, and then switching things up again when needs, or tastes, change. Don't feel like you have to homeschool the same way as your neighbor, your friend, or that really experienced homeschool mom at co-op. Yes, it's a great idea to gather opinions and thoughts on the different options available, but in the end, it's your school. You get to decide, from the literally millions of different curriculum combinations and make your homeschool work for you. Get your copy of The Unplanner, 2017-2018 Edition today! Back-to-school is in the air! Studies may have already resumed in your house, or the first day back may be coming up soon. Either way, it's not too late to visit my store and get your copy of this year's edition of The Unplanner. If you are not already familiar with The Unplanner, it's a different kind of organizer made just for those of us who are a bit overwhelmed by the planners with too many pages and way too many blanks. 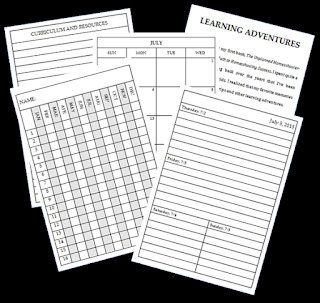 If you're the sort who is looking to do some light planning, and mostly keep track of what your kids have done through the year, this is the organizer for you! With month-at-a-glance pages for keeping track of upcoming events and appointments, weekly pages for scheduling lessons, attendance sheets and pages for keeping track of the curriculum you use, the books your kids are reading and the learning adventures like field trips and experiments you will want to remember forever, The Unplanner has all the pages you want and none of the extras you don't. And at just $7.99, this handy 6 x 9 inch, professionally bound book with a pretty floral cover is less expensive than many of the "free" printables you might place in a binder or have bound at the local printer. 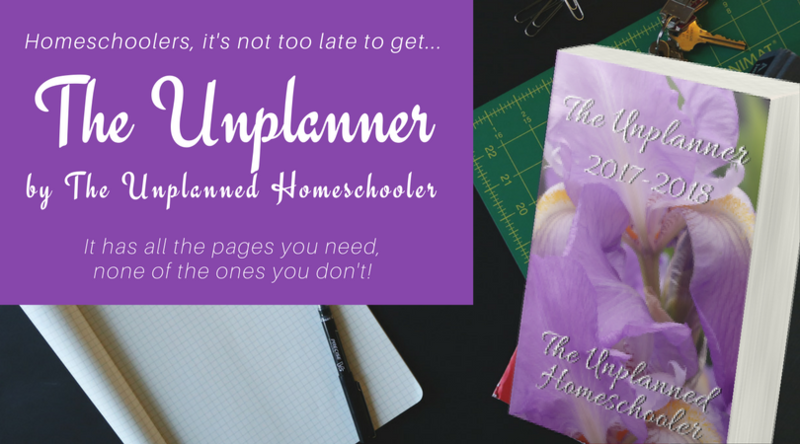 Treat yourself to a copy of The Unplanner today! 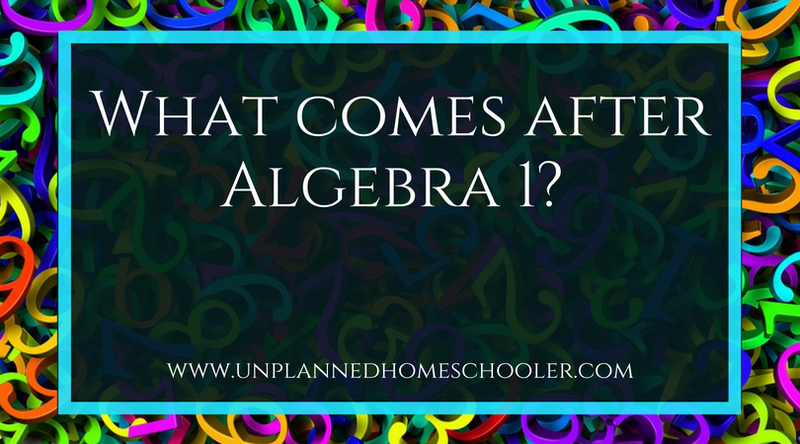 What comes after Algebra 1? 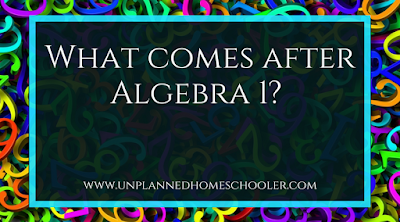 "What should my high school student take after Algebra 1?" 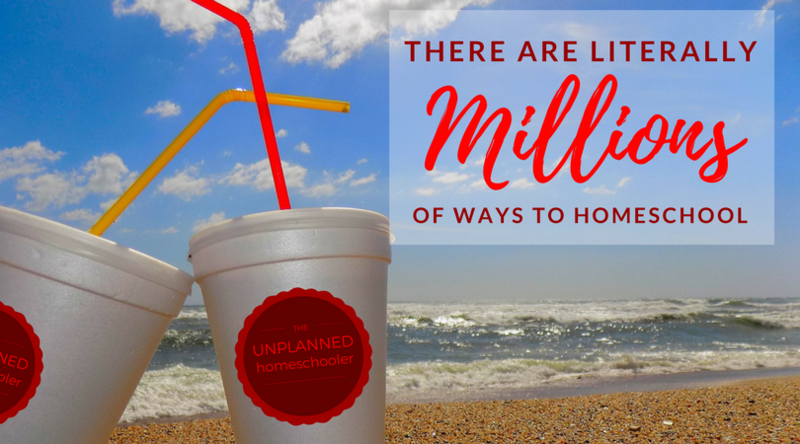 That's one of the most commonly asked questions among homeschoolers, and it's not so simple to answer. Where do you go next, into Algebra 2 or Geometry? Ask this question in any large homeschool group and you are sure to get a lot of debate. When I was in school, most students enrolled in Geometry right after Algebra 1, but I chose to enroll in Algebra 2. It made more sense to me to cover that material immediately following Algebra 1, and I did well taking the courses in this order. There is a strong argument to be made, however, for taking Geometry immediately after Algebra 1, because a student would have more exposure to those concepts before taking the PSAT, thus potentially raising their score. As my twins were approaching the end of Algebra 1 this year, I realized it was time for our family to make this difficult decision. I had curriculum for both courses ready to go, and had reviewed the first several chapters of each. I just needed to pick which one we would do first. After a lot of thought, I decided to try a different approach. We're going to do both Algebra 2 and Geometry simultaneously. Now, that doesn't mean I am doubling the workload on my kids. No, in fact, they will be maintaining the same weekly schedule as they did with Algebra 1. But instead of doing one full course and then the other, we are going to do one small section at a time, and switch back and forth between courses. Some folks have called me crazy for trying this approach, and others have called me brilliant. I'll settle for a little of both, so long as the plan works well for my kids. We can always revert to doing one course at a time if the alternating schedule doesn't work out, but I think that my twins are bright enough to handle switching back and forth. The best part of this plan is that both Algebra 2 and Geometry will be fresh in their minds when it is time to take their PSAT next fall. We do a year-round schedule with intermittent breaks, and they should be finished with most of both math courses by next October. If everything goes the way I hope it does, this will give them their best chance to score well, and hopefully earn some scholarship offers. I'd love to hear what you have planned following Algebra 1, or if your students have already moved on through higher math, how they did using one approach or another. I love riding a Ferris wheel. 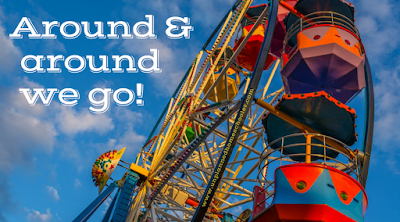 Next year will mark 125 years since George W. Ferris built the first Ferris wheel in Chicago in 1893. Ever since then, thrilled riders have hung on as wheels around the world took them to new heights, showing them unique views of the world around them along the way. My favorite part of riding the Ferris wheel is not the exhilarating, non-stop ride you enjoy once the cars are full and the wheel gets up to speed. It's actually the many stops along the way, each one at a different point on the wheel, as some riders get off and new ones get on. Every stop brings a new view, a new perspective to sit back and enjoy. Sometimes even the air seems different at a new stop. I love to just look around and take it all in, enjoying every moment before it passes, always too quickly, and the wheel starts moving again. Life as a homeschooler is a lot like a ride on a Ferris wheel. Each year we go around and around again, sometimes letting one child off as they graduate and leave the home, other times bringing a brand new student on board as a little one joins the learning crew. And along the way there are stops, each at a new point with so much to discover. It's a brand new school year, and as I sit here in my recliner, organizing the resources I will use for the classes my kids will be taking in the fall, my heart skips a beat. I feel like I am sitting on a Ferris wheel, near the top but not quite, my gondola swaying in the breeze as I look at my children. My twins are about to start 10th grade. How did they grow up so quickly? They'll start driving this year, and taking concurrent enrollment classes at the local university. Don't move, wheel. Not yet. My youngest will be starting 5th grade this semester, a year ahead of where she would have been if she'd started kindergarten in public school at age five. She's excited for the changes this year will bring, as she joins a new co-op and maybe makes new friends. I feel the wind change and I know that the ride is about to take off again. This year will be different than any of the ones before. After eight long years, I finally retired my post as leader of the local homeschool group, and going into this school year I feel like a weight has been lifted off my shoulders. I laugh in anticipation of a fun year, thankful for the mom who took over my duties so I could change my focus. The view is different from here. School starts back for us full time next week. The Ferris wheel is about to start spinning again. I take a deep breath and one last look around. I'm ready! How about you? You may have seen the meme that the Facebook page, Math is Awesome, shared this week. 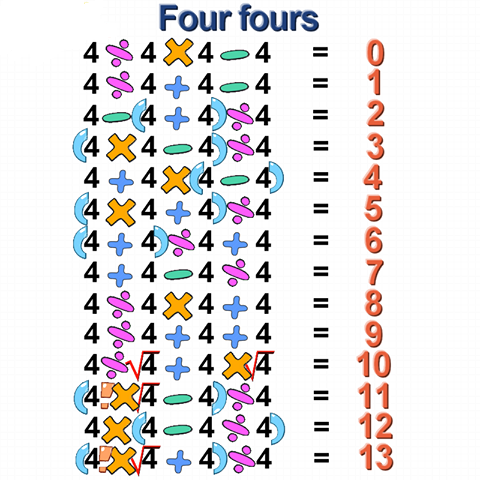 Using addition, subtraction, multiplication, division, square roots, factorials and carefully placed parentheses, students can solve expressions using four fours to equal every number from 0 to 13. I thought this would be a neat exercise to give my own homeschoolers, so they could see the good old order of operations in a creative way. With a little bit of work, and a refresher on how to type the division symbol, I turned the meme into a worksheet. Click here to get a free copy of the worksheet you can use with your students. 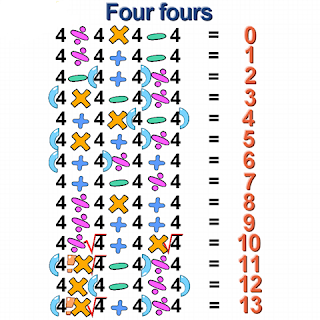 And just in case you don't remember everything from your algebra class, in the problems near the end, 4! 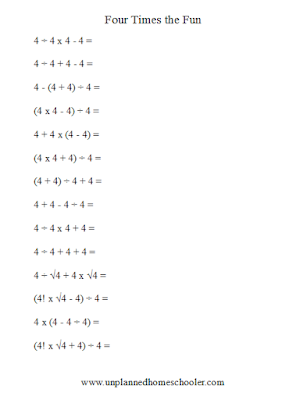 means 4 factorial, which is 4x3x2x1. Have fun! 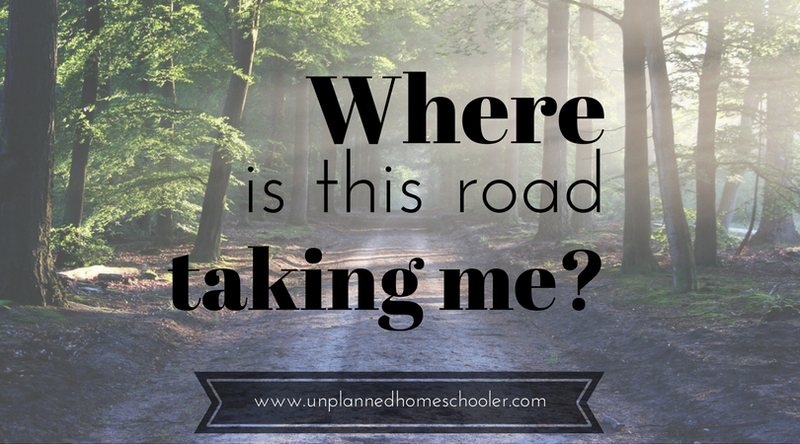 I don't know if folks who don't know me well in real life follow this blog closely enough to know when I take some time off from writing, but in case you did happen to miss me over the last couple of months, I wanted to take a moment to check in and confirm that yes, I am still here and still homeschooling! I had to put my blog on the back burner over the holidays, as my family dealt with some difficult times. My mom had some pretty severe health issues, including being hospitalized with a stroke before Christmas, having surgery shortly after that to resolve a blocked renal artery and finding out she would have to have open heart surgery as soon as possible. In the middle of all that, my uncle on my mom's side passed away following an extended stay in the hospital. 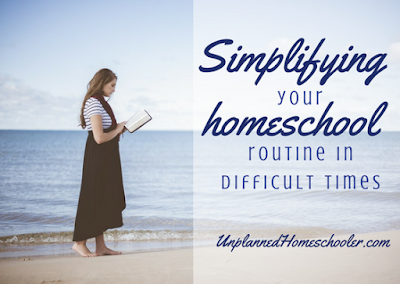 When it became clear that this school year was going to be complicated by difficult times, I realized I would need to simplify our homeschool routine in order to keep things running smoothly and keep the kids on track with their studies. 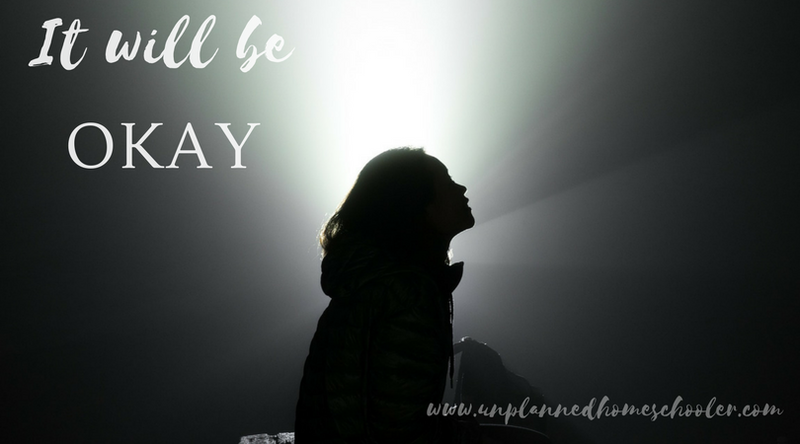 You may be homeschooling through difficult times as well, or find yourself doing so in the future. These are some of the things that have helped us to keep homeschooling in spite of the complications. From running our local homeschool group and writing this blog to taking the kids to extracurricular activities and events, I had several obligations outside of simply homeschooling and maintaining the house, which in itself is a full time job. One of the first things I did, when I realized we were in the middle of a difficult season, was pull back. It's not always easy to reduce your obligations, especially if you don't have others to pull up the slack for you. I am not a super-blogger with a virtual assistant on staff to keep things going when I need to step away, and I didn't have a reservoir of pre-written pieces I could just schedule to post in my absence. So stepping away meant letting the blog sit idle for a while, and being okay with that. 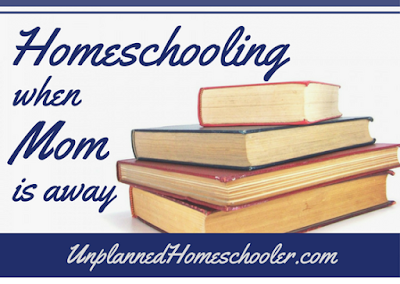 Reducing my outside obligations in our local homeschool meant letting some things go, too. During a time when I would normally be busy planning activities and leading field trips, I have had to step back and hope others would take my place. The next thing I did when I realized we had weeks, and possibly months of work ahead of us helping my parents as my mom recovered was to revise our schedule. I knew that my twins would need help with things like learning new concepts in algebra, but they could easily handle studying world history on their own. So I changed our schedule to focus more heavily on math at the beginning of this semester, before the heart surgery, so we could get more of that done while I have more time at home. 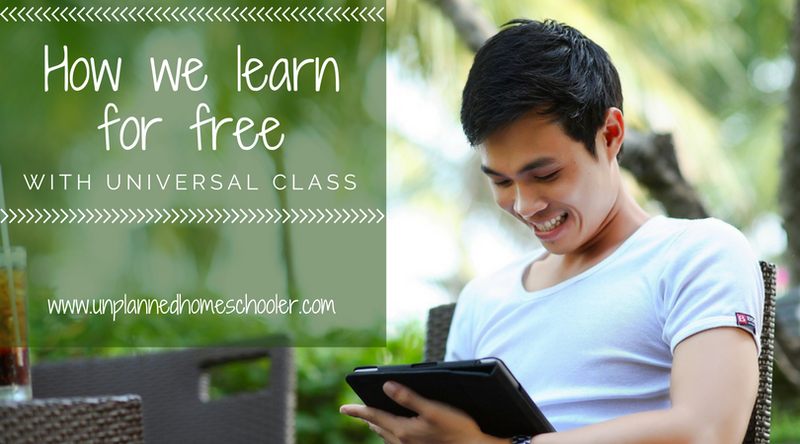 As homeschoolers, our schedule is wonderfully flexible, in that we can move lessons and even full courses around to accommodate our family's needs. While I am spending time with my mom at the hospital, my twins will likely be working on history and literature, subjects they can do without supervision, and my youngest will be focused on reinforcing a few skills that need work before moving on to new concepts in the spring. Along with revising our school schedule, I realized quickly that I needed to use this time to reassign the household chores. As my kids have gotten older, their list of chores and household duties has not always kept up. Like many moms, I have found it easier to do things myself than to delegate the responsibilities that I should. But I needed help, and my kids are more than capable of doing extra work around the house. Of course, with more responsibilities come greater rewards, so in addition to increasing their basic chore list, we gave them lots of opportuinities to earn a few bucks by going above and beyond what was expected. In the coming months, there will be plenty of ways for them to earn both spending money and other rewards by helping with big jobs at our house and their grandparents'. There's nothing like hard times to remind you of your faith. Of course, we find ourselves praying a lot lately that my mom will be okay, but we also find ourselves feeling thankful for the little ways we see God moving in our lives day to day. It shouldn't take a crisis to bring us closer to Him, but there is nothing wrong with resting on God's promises and leaning on His grace and love during times of trouble. Letting difficult times put your homeschool routine in perspective can be a good thing. Yes, we're still focused on learning, and on getting through this year's material in a timely manner, but if that time ends up encompassing part of the summer, so be it. 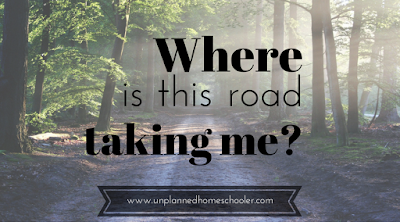 Even though a lot was added to our plates in the middle of this school year, simplifying our homeschool routing and adjusting our priorities has actually made the load seem lighter than it was before, and maybe by the time this rough patch is over, we'll be breathing that much easier.